Miley Cyrus, star of Disney's Hanna Montana, received a lifetime achievement award from the Milky Way Arts and Sciences Collective. She accepted the award at Bolingbrook's Clow UFO base. "I'm honored, really!" Said Cyrus. "It's so humbling to know that I have fans rocking out to my music across the stars!" Cyrus then performed a short concert for 300 fans selected fans from around the galaxy. They screamed, gurgled, and made other hysterical sounds as she performed "Best of Both Worlds," "7 Things," and "The Climb." Ten human guests, and their guardians, received tickets to the concert after cracking a secret code on Cyrus' official web site. 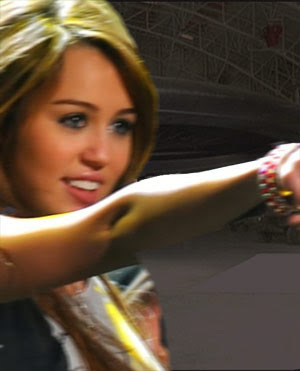 "I got to see Miley Cyrus and space aliens!" Screamed Jill Plano, 11 years-old, of Whittier, CA. "It was awesome!" During the press conference following the concert, Xlog Gopa, Symbot of the Collective, denied that Cyrus was given the award to promote her new movie, and the interstellar syndication of Hanna Montana. "There are some intelligent species that would consider 16 to be old age. Miley's work is the best they will experience in their short lifetimes. It is only fair that we should give her a lifetime achievement award." Gopa added, "Miley's albums and merchandise has taught billions of our youth how to be proper consumers. All of her fans, podling and live birth alike, have helped mitigate the affects of the galactic depression. We think of her work as a galactic stimulus plan. Not even Tiny Tim's work had this much of an economic impact." Cyrus also responded to charges that recent pictures of her on the Internet disqualified her for the award. "I'm a teenager, and I make mistakes. I thought it would be fun to pose in my underwear on the Internet. When my dad showed me e-mail from a fifty-year-old man, I threw up. He was old enough to be my grandfather! I realized what had done not only to myself, but to my fans as well. I will never do that again!" She then added, "Sometimes we do things that embarrass our families. My father recorded, 'Achy Breaky Heart.' I almost didn't have a singing career because of that song." When asked if she was concerned about being replaced by the Jonas Brothers, she laughed. "I've had a successful music career all of my life, and I don't see that changing. There plenty of room for talent at Disney!" When asked about Hilary Duff, Cyrus replied, "Who?" Bolingbrook Golf Club: Roger is not our only customer!